A while back my Janome sewing machine packed in and had to be sent off to be fixed. Meanwhile I was going to be left without a sewing machine for several weeks. Not good! Being an essential part of my business, really can’t work without one, I decided I’d need to buy a new one. The fact that my current machine had stopped working, highlighted the fact that I should maybe have a backup so that I could always have one on standby. Well, the justification over, the new one I found was a Frister & Rossmann Professional Quilter’s Edition QE404. 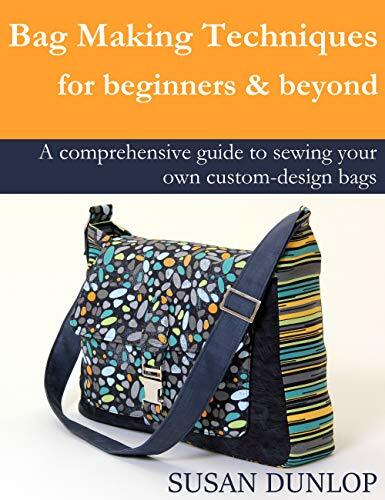 Not that I’m a quilter, although I dabble in it sometimes, but I was drawn to this one due to all the features it had and there were quite a lot of good reviews for it online. The bonus was that it was priced very reasonably for what you get, £289 and it came with a fantastic freebie bundle. I bought my machine from The Ironing Press Company which has shops on Ebay and Amazon. Stitches: It has 170 plain and decorative stitches, including up to 6m alphabet stitching. I’m not sure if I’ll ever use them all but the range of stitch types is fantastic, there’s even pretty floral ones, animal ones, Japanese symbols, the list is endless. The machine also boasts 5 one-step automatic button holes, with 13 different styles, plus eyelet stitch. Electronic / Computerised: this was a first for me, to have an electronic computerised machine, and I’m very impressed. It has an interactive LCD display screen, small but does the job and shows clearly what has been selected. It’s also helpful if you’ve done something wrong or a glitch arises, as it immediately stops the machine and shows a symbol to indicate what’s wrong. There’s a stitch memory so that you can program your selection of stitching, including number or letter sequences and it can stop at the end of your chosen sequence. 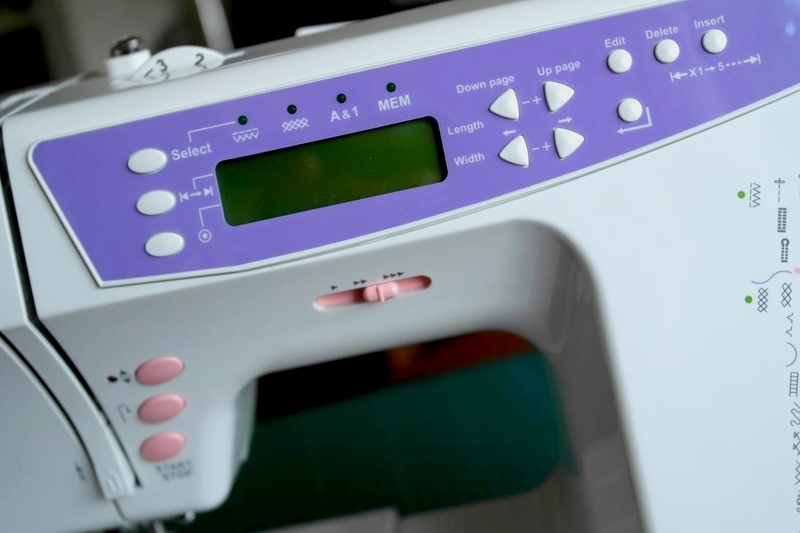 Most of the functions are controlled electronically, so at a push of a button you can easily access some very useful features and quickly adjust the stitch length or width. Automatic Needle Threader: There’s a lever that you can bring down to help thread the needle. I had this on my old machine but never used it as thought would be fiddly. I tried it on the new one and always use now as it’s really good. It’s a bit difficult to use at first but after you’ve tried it once or twice it’s a breeze. The needle must be at it’s highest position then you bring the lever down and follow the instructions for where to hook your thread. There is a little tiny grabber that goes through the needle eye and, on release of the lever, it pulls the thread though. Twin Needle Threading: An extra spool pin is supplied which is slotted into place to allow two different threads to be used along with a twin needle. You simply thread up as normal and then put each thread through each needle eye (automatic needle threader can’t be used). Speed Limiter: I’ve found this to be a really useful feature. You can control how slow or fast you stitch, great for beginners who may prefer to stitch slowly at first and then gradually build up the speed as confidence grows. Even for the experienced though, it’s useful for the times that you need to control the speed you stitch. I like the way the machine starts off slowly and then within seconds it gets up to the maximum speed that you’ve set. If you try to press the foot pedal too fast when you first start sewing, the machine will not start. It stops itself until you lift your foot off and then press it down slower. I found this a bit annoying at first but soon got used to it and I think this would be another good feature for beginners, so that you start off slowly and gradually build up the speed. Stop/Start Feature: This function allows you to stitch automatically, without the foot pedal being plugged in. Very useful I think. I tried this on a slow speed to begin with until I got used to using the stop/start button instead of the foot pedal. Needle Up/Down Function: This is one of my favourite functions on the machine. You maybe wouldn’t think it would make such a difference but it really does. It’s not until you have this feature that you realise what a useful one it is. It eliminates the need to use the hand wheel and makes sewing so much quicker and less fiddly, as a result. A handily placed button is used for setting whether the needle should be up or down whenever you stop stitching. When you start off, you simply position your fabric under the foot as normal and press the button to make the needle go down. Start stitching and whenever you stop, to adjust or move the fabric around, the needle will stop in the down position. When you’ve stopped sewing just press the button to put the needle back into up position. Reverse Button: Most machines have this feature for back-stitching but, being electronic, this one took a little bit getting used to. It works really well but when you press the button you need to be aware that the machine will slow down (helpful) and there’s a very slight delay (1-2 stitches) before it goes into reverse. So you need to press the button just before you want to go backwards. 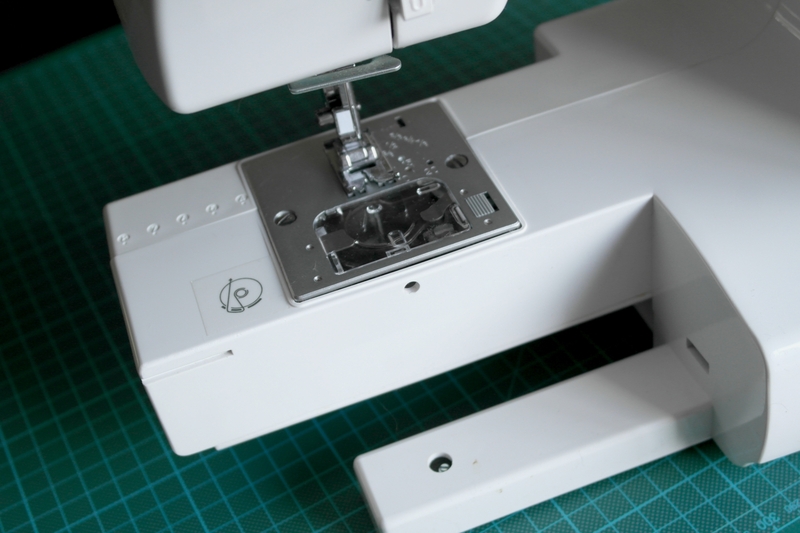 Free Arm: This is essential for sewing trouser legs and sleeves. I use this facility a lot when I’m bag making, mostly for stitching around the top edges of bags and accessories. On this machine, you remove the accessories box to allow you to fit trouser legs and sleeves, or in my case bags, over the free arm. Quilting and Embroidery: 20 of the stitches have been specially designed for quilting, giving you plenty of variety. The machine also comes with a flat bed table extension to increase working area. The feed dogs can be dropped for doing free hand embroidery or for traditional darning. 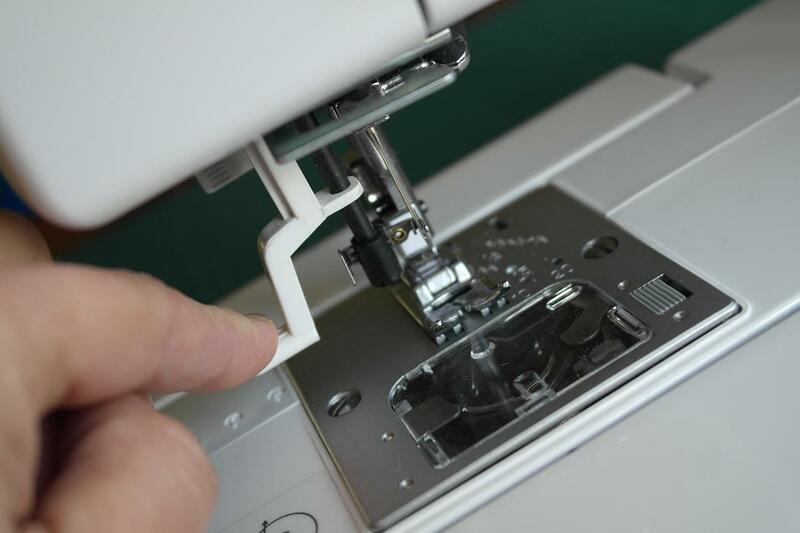 Sewing Feet: I am so impressed by the range of sewing feet supplied: general all-purpose foot, narrow hem foot, buttonhole foot, gathering foot, blind hem foot, straight sewing foot, overlock foot, cording foot, embroidery foot, walking foot and cutting/sewing foot. I don’t think I’ll want for any other feet ever (apart from a teflon coated one I’d bought separately for sewing laminated cotton). Accessories and Freebies: I think everything you could need to start sewing comes with this package. As well as all the extra feet (above) it comes with the usual accessories: bobbins, screw drivers, spool caps, button hole cutter, extra spool pin and finger protector. The extra freebies I got were a pack of scissors in all sizes, thread nippers, loads of extra needles in different sizes, a box of 10 large sewing threads, seam ripper and a sewing essentials kit. 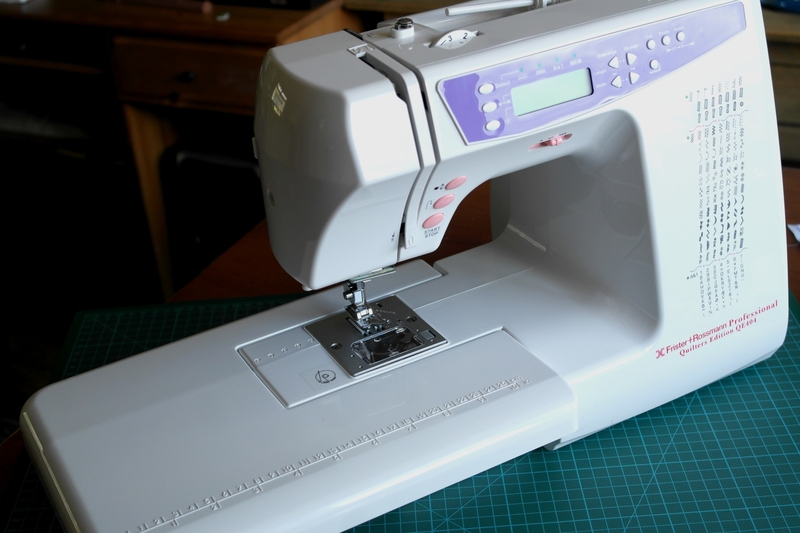 All-in-all this sewing machine is a fantastic all-rounder. I love using it and it’s ant-jam rotary mechanism is very quite and works smoothly. 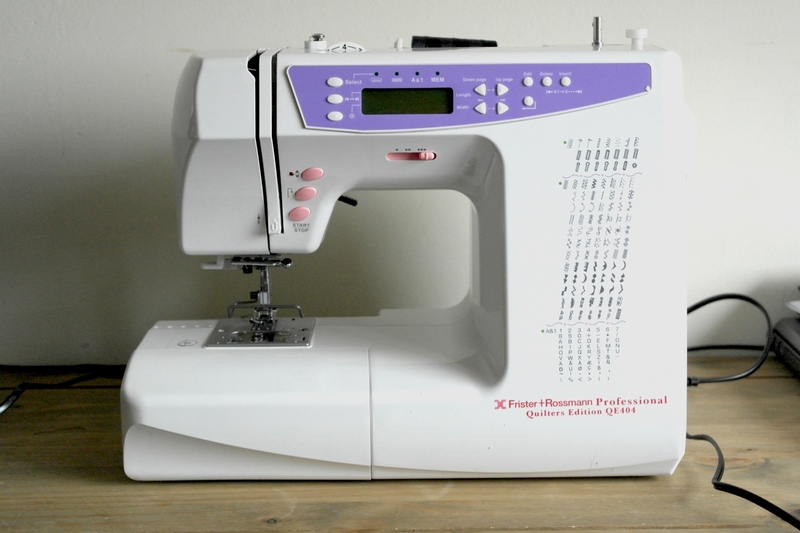 It’s capable of sewing all types of fabric, from light weight delicates to heavy denim.